Ticket to Ride fans – Meet Alvin & Dexter! Alvin the Alien and Dexter the Dino are two wacky Ticket to Ride characters ready to stomp opponents and zap tickets in Alvin & Dexter – A Ticket to Ride Monster Expansion. 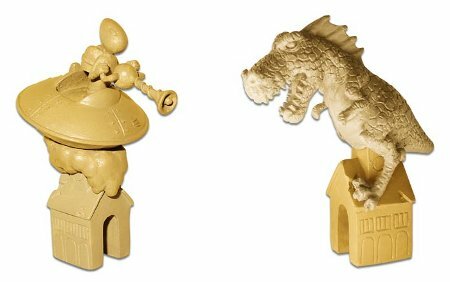 These two finely detailed monster figures turn any location they occupy into a City in Chaos – blocking routes from being built into or out of the city; and any Destination Ticket to a city inhabited by either of them at the end of the game is only worth only half its normal point value. Players may move a single monster to a different city anytime during their turn by turning in 1 or 2 Locomotive wild cards and moving the monster up to 3 cities away for each card they discard. The player who moves Alvin (or Dexter) the most during the game will also earn a bonus. Alvin & Dexter are a perfect post-Christmas/New Years addition for Ticket to Ride fans and can be played on any Ticket to Ride map. You can expect to see Alvin and Dexter in early February at better game stores around the world. Suggested price $13/€10. 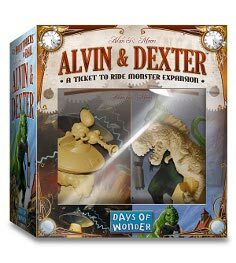 Learn more at the Alvin & Dexter – Ticket to Ride Monster Expansion web page. This entry was posted on Tuesday, January 4th, 2011 at 17:18 and is filed under Games, News, Ticket to Ride. You can follow any responses to this entry through the RSS 2.0 feed. Both comments and pings are currently closed. Haha what an interesting twist to ticket to ride. I like it! The figures are just under 2 inches high (roughly 45 mm). And Zak – no, we’ve got plenty of other ideas! I have to agree with Mike H. This idea does not work with the Ticket to Ride Theme at all!!! I also agree with Zak, It does look like you are running out of ideas when something like this comes up. Now you guys make some of the best games in the industry…I have enjoyed all I have played. Please tell me this is a joke. I love Godzilla movies and a game about a giant monster attacking a city sounds great for me…..just don’t force it in another theme. That’s why it’s an expansion. It’s completely optional! Some may very well enjoy the chaos this will add to a “friendly” game of Ticket to Ride. Some will buy it. Some may not. The “success” of the this idea will become much more obvious in February. Or perhaps, Fonzie on a motorcycle, jumping over a shark-filled train. Well; I actually like a change in a game I have been playing for years: I know players that dislike T2R for having too little interaction with players which they thought it improved with the depots but yet they miss something. I think Alvin & Dexter will make a great addition to a game once in a blue moon; especially with 1912. It looks like the kind of expansion you either love or hate. Also for those who don’t like the fantasy element, just think as the workers in those cities are on strike rather than a monster attacking it. I think monsters would have been better for Memoir. That way you could play out all those 50’s monster movies. Wow, a lot of really negative comments here. If you don’t like it, don’t buy it! I, for one, am excited for any expansion to one of the greatest board games ever made. And it’s also an expansion that loks like it adds some nasty player interaction WITHOUT adding more luck (TTR has just the right amount of luck in my mind) or too many more rules. Haha, yeah, I find this addition hilarious. I probably won’t buy it, because for me it doesn’t work with the theming, but it doesn’t sound like jumping the shark – merely something to tide us over until the next real board comes out. I hope it’s this year. DOW, I love the risk in bringing this product out…Great job. Very cool way of trying to push the game to many different boundaries…Keep those awesome ideas coming…I’ll take one by the way.. I like the idea of workers in the city on strike as mentioned by one user. The monsters seem a bit of a stretch. The “on strike” fits with the theme and accomplishes the same result in a more subtle way. When will this idea be incorporated into the on-line game?